Sri Lanka - Rice & Curry ! So we arrived back from Sri Lanka two weeks ago and I’m still dreaming about it. Such a varied and beautiful country, and the food! So refreshing to see vegetables celebrated like this, not just in a few places but everywhere. Eating what’s in season, making the most of what’s in abundance from the ground, healthy and flavour packed. The range of vegetables dishes and curries are endless, as one cook pointed out, they have incredible variety all year round so why not make the most of it? We had jackfruit curry, cashew, tomato, cucumber, aubergine, green bean, okra, pumpkin, bitter gourd, to name a few. Then you have the sambols and sides, oh mama! Pol sambol (coconut sambol) was our favourite, and we really loved that dish asking for it everywhere we went! Spicy, fresh and a treat having fresh coconut everyday when you’re coming from the cold. It’s made with fresh coconut, red onion, dried chilli flakes, lime, fresh green chilli and tomato. When a restaurant had no pol sambol we enjoyed the chilli paste they serve, (you know we LOVE chilli!). This is chilli flakes cooked with garlic, pandan leaves and a little sugar and salt. Then there are the pickles that are served with meals and multiple ways of serving rice. Pittu, an unassuming looking dish but I loved it, ground rice layered and steamed with fresh coconut. Red rice, white rice, string hoppers and the famous hopper (more pancake style) – both made with fermented rice. I’ll be perfecting mine with the gadgets I brought home. I’ve chosen just a couple of recipes to write up here, I will add more in time but for now and sorry these have taken so long! Since I’ve been back I’ve had non stop events so this is the first opportunity to take some time to write these up and post them. It’s hard to chose a dish from our travels, but dal comes with every meal and I could never get tired of it so I had to post my Sri Lankan dal recipe. Very slightly different everywhere you eat it, but I think I’ve done this dish justice. 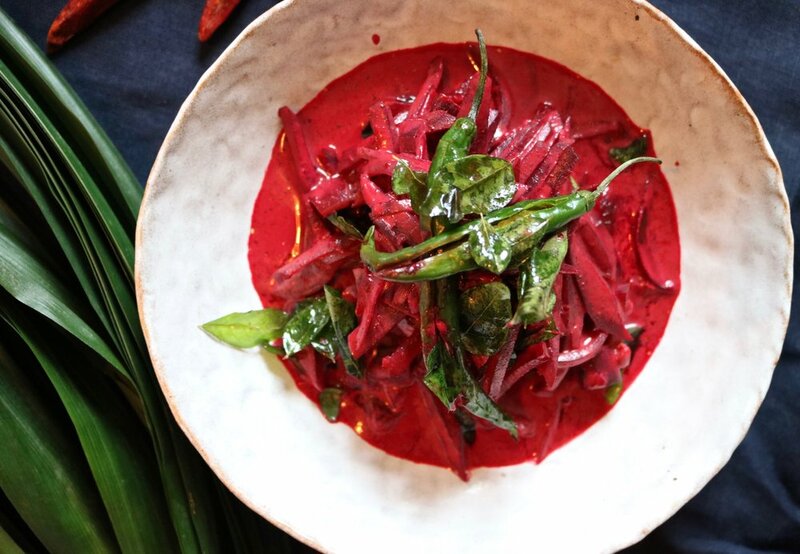 Then the beetroot curry, maybe a bit of a surprise to see beetroot in a curry but it’s really special and in season here now. Delicious, exciting, warming, healthy food to get us through the winter blues. In the photo we also have mustard, date pickles. We tried this at one of favourite spots to eat, Hela Bujon. SO intense, but cuts through the curries, with whole red shallots and green chilies it’s not for the faint hearted, I’d say something of a love / hate dish. I also have photo’d, seeni sambol – a spiced caramalised onion sambol, on the milder side compared to other sambols but really very tasty. There’s a great depth to it that comes from the spices and the slow cooking. A note on ingredients, curry leaves are fundamental to Sri Lanka cooking, they’re in everything! Abundant and growing like crazy over there, they’re certainly less available here. But!.. you can find them, some Asian grocery stores sell them and it’s possible to find them online too. Once you do, buy extra as they freeze well. They have the most beautiful and unique aroma. Dried I don’t really find comparable but if you can’t get fresh you can use these. You’ll need about double the amount. Pandan is also possible to get hold of at Asian grocery stores, this has a more subtle slightly sweet aroma, if you can’t find this I can’t think of a substitute so you can leave this out. The curry powder, although it may seem like a pain to make, will keep well in a jar and can be used for so many vegetable curries and dishes. Don’t be tempted to buy curry powder from the supermarket, it’s not the same thing! Lastly before the recipes, to tell you about our events. We hosted our first Yoga Brunch of 2018 last week with a full Sri Lankan menu. Such a special afternoon, I went a little overboard and made everything under the sun, but it was appreciated by our lovely guests! If you missed out on this one we have more coming up. Details below the recipe. I’ll be back soon posting more plant based delights. In a large pan heat the coconut oil, add your onion and sweat for 5 minutes until they begin to soften. Add the garlic and ginger, cook for another 2 minutes, then add your spices, curry leaves and pandan. Drain and rinse the lentils, add them to the pan, cover with filtered water up to an inch above the lentils, add the coconut milk and a good pinch of salt. Cover the pan and cook for about 20 minutes, until the lentils are cooked, adding a little more water if you need to loosen the dal. While they’re cooking, heat a small fry pan, add the coconut oil and red onion, cook for a few minutes before adding your garlic and curry leaves. Continue to cook for another two minutes. Once the dal is done mix through the fried element or serve on on top as a garnish. In a medium pan, heat the oil, add the onion, cook for a few minutes until soft, add your garlic and spices, continue to cook for a further 2 minutes. Add the beetroot, fresh chilies, coconut milk and water. Cook for about 15 minutes until the beetroot is cooked but still has crunch. One of the nice things about this curry is the bite the beet has so try not to lose that by overcooking. Squeeze half a lime into the curry and serve with steamed red rice, your dal, fresh sliced chilies and some steam fried kale on the side. To steam fry by use a large fry pan, heat and cook kale with a good splash of water, oil and pinch of salt. *Sri Lanka curry powder recipe - adapted from Sri Lanka: The Cookbook. Eleah Waters, will be teaching 90 minutes of pilates followed by fresh, plant based food. What promises to be another gorgeous afternoon. A relaxed and friendly atmosphere and an pportunity to relax and let go with like minded people. This month we’ll be donating £1 of each ticket sale to Made In Hackney- “ At Made In Hackney we believe everyone should have access to healthy, affordable food that’s good for people & the planet”. Only a few tickets left! Book here. The perfect combination of yoga and fresh plant based food. We'r back with the lovel Emmy Yoga. Again, an afternoon feeding body, mind and soul. Meet like minded people, relax and do something different in a beautiful setting in the heart of Shoreditch. his month we'll be giving £1 of each ticket sale to omankind Worldwide ' 'Every day women and girls face discrimination, poverty and violence just because they are female. We’re working to change that.